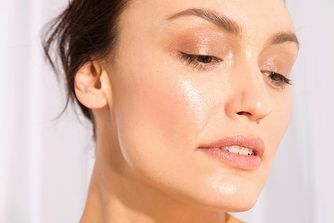 Also known as ‘Your Beauty Translator’, THE INKEY LIST’s aim is simple: break through beauty jargon to deliver a straightforward take on skin care’s most-wanted ingredients (at astoundingly reasonable, ‘give-it-a-go’ prices). One of the most important factors for healthy, plump skin is hydration – and what’s everyone’s ultimate hydration hero? Hyaluronic acid, of course. Naturally found in our skin to maintain hydration, hyaluronic acid is a moisture-binding ingredient that can hold up to 1000 times its weight in water. Essentially a magnet for moisture, this formulation stars 2% pure hyaluronic acid (at different molecular weights to hydrate every layer of skin) to plump up fine lines and hydrate all skin types. Naturally found in our skin to maintain hydration levels, hyaluronic acid is a skin care superstar for a reason. Essentially a ‘moisture magnet’, it attracts moisture from the atmosphere and can hold up to 1000 times its weight in water. Over time, our hyaluronic acid levels decrease (sob) resulting in dullness, fine lines and uneven tone and texture. 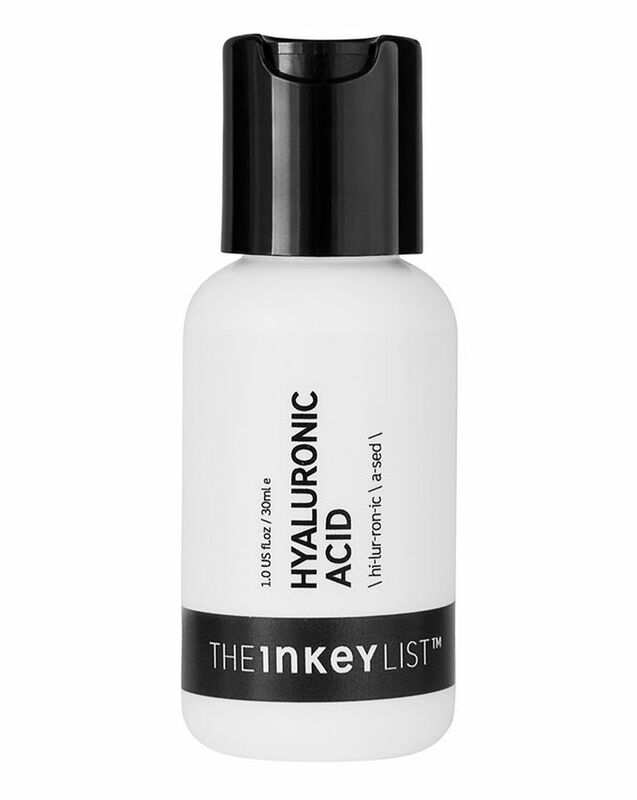 The perfect foil for this unfortunate state of affairs, THE INKEY LIST’s gentle Hyaluronic Acid Serum stars the stuff at a pure, 2% concentration and in three molecular weights (high, medium and low) to ensure maximum absorption at every layer of your skin. Dehydrated skin affects most of us (even oily skin can be dehydrated) and, differing from dryness, results from a lack of water in the skin. 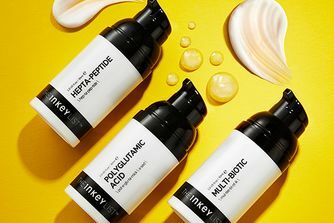 Replenish this water with The Inkey List’s high-quality, impressively affordable formula and you can expect plumper, healthier skin, with fewer visible fine lines and wrinkles and a more even tone and texture. It can even aid the efficacy of products applied after it – genius. Simple, uncomplicated. A great quality, super reasonable hyaluronic perfect for a daily dose of hydration. An absolute essential. Locks in and attracts moisture to keep your skin super plump and refined. A tad less sticky than some others but a layer of any moisturiser over top will eliminate any stickyness. I recommend mixing 2 drops or so of this with either the inkey list heptapeptide, or the ordinary buffet for a complete daily hydration shot supercharged with anti ageing peptides. A simple moisturiser to finish and you’re all set! I have used this serum for six months (face + neck) as a part of my day-time regime. Currently, I'm on my 6th bottle. I have a combination skin with rosacea and in my case this serum functions very good. It moisturizes skin without any irritation. The price of this product is very fair! I will use it again and again! Absolutely love this product, the price is right, it's instantly effective and a complete must have for those with dry/dehydrated skin. Brilliant! My skin texture has changed from the third day and people have noticed it. I ordered 3 more bottles. I have had good experiences from The Ordinary's HA serum and expected this to be similar. Not so much... not very hydrating and oddly making my skin react a little bit. It was not for me. The packaging is bad, tbh, it feels cheap and it gives you too much product. A dripper would have been so much better, and since The Ordinary carry basically the same product for the same price, but better packaged I prefer theirs. Also, it has a smell, and I don't see that much of a difference. Firstly I really hate the packaging, it's hard to use and to estimate quantity. I prefer the dropper like The Ordinary much more. Please change the packaging if you can. I live in humidity and a hot area so this is not my cup of tea as it leaves my skin oily. I like to mix it in with my moisturiser. I've been experimenting with different skincare lines in the past years, considering Deciem brands my ultimate holy grails up to now. I still adore those products, however, after using up my old The Ordinary Hyaluronic Acid, I was looking for a great AM serum that doesn't make me oily but neither makes my combo skin dehydrated. I purchased this Hyaluronic Acid Serum together with the Q10 Serum from The Inkey List and I LOVE them combined as part of my morning and evening routine as well. After cleansing, I use this and follow with the Q10, everything else in my morning routine stayed the same. I swear I already noticed a huge difference on the first day. My skin looks so much more plumped and balanced, that usual oiliness didn't happen at all. This serum is also incredibly lightweight and not sticky like the one by The Ordinary. I'm so happy with my purchase! I received this product less than 24 hours ago, have used it twice (at bedtime and the next morning) and am noticing IMMEDIATE improvement in the fine lines, moisture level, and general plumpiness of my skin. This liquid serum is fragrance free, goes on extremely smooth, and has truly done what it says it will just about instantly. Definitely looking forward to continued use and even better results. I also have sensitive skin, and other products have bothered me in the past ... not so with this one. Incidentally, I purchased a few other products from this line at the same time as this, and will be reviewing them similarly - each of them is making a noticeable, instant improvement in my skin! The first serum you need!! Always the first step in skincare after cleansing and toning to ready my skin for a more specific treatment. You’ll notice a difference in a week. Excellent stuff! I bought this product recently and love the actual serum. Smooth, easy to apply and a little goes a long way. Both my 20 something daughter and my 50+ self are really impressed with the formula. No pilling under other products and make-up. The only thing I don't like is the packaging. The other hyaluronic acids I've used - including high end and budget versions - use a dropper, which is much easier to ensure dispensing the required amount. Hasn't put me off ordering again though. It's a quality product at about a sixth of the price of my previous favourite. I really like this product. It does what it promises, and hydrates my dry skin really nicely! I wish it came in a dispenser with a pump but for the price it is just fine. The serum itself is lovely and simple, an easy way to get Hyaluronic Acid in the routine, but the bottle is impossible - always end up with too much product to use as the lid mechanism causes a small vacuum and then suddenly half the bottle contents in my hand! I have used this for a week now and can really see a difference. I live in a cold climate and I have sensitive skin. I use this in combination with one of their oils and my skin feels hydrated all day long. It gets 4/5 due to I haven't used this type of serum before so I have no reference to compare. I've used a few different hyaluronic serums, and this one is brilliant. It hydrates my dehydrated 40+ year old caucasian skin, and sits nicely under my other skin care and make-up. The price is incredible, and it doesn't come with a side order of drama from the company's founders. There is nothing I dislike about it, and I'll be checking out other products from the brand on the basis of my experience with this serum.